The best thing about it is that it has different colors and light intensity. That means that if you're reading just before going to bed, you can place the light in your prefered intensity but in the warm color. That color will allow you to fall asleep faster after reading. Another great thing about this light is its design. It is not perfectly round, that means that you'll be able to place it vertically on horizontal surfaces thus directing the light in a specific direction. We have the feature no one else has... It is a illuminated dimmable makeup mirror. With that mirror you'll be able to see yourself wherever you go to make sure your makeup looks good, add makeup or check that you don't have any food on your teeths. As it is illuminated you'll be able to use it at all times, even when it's dark outside. The mirror is also extremely good whenever your at home and need to look if your skin is clean. By looking at your skin close to the mirror you'll be able to see and remove blackheads easily. The quality and the amount of light this ring light provides is the best in its category. On top of all the lights, there's a plastic diffuser, making the light look even more beautiful on your face. The geometry form of this ring light will also makes a beautiful circle appear in the center of your eyes, making them even more appealing. It is like having a professional photoshoot but without having to spend so much money. 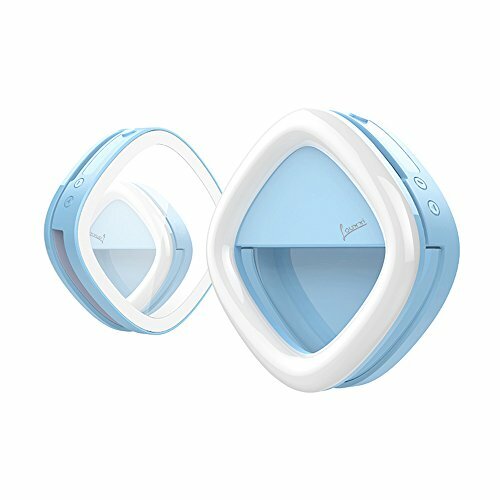 Illuminated Selfie Mirror: The back of the ring light contains an illuminated selfie mirror with dimmable brightness. It allows you to see your makeup wherever you go, clean your face from blackheads or see if your teeths are clean. Professional Lighting. The 53 LEDS, the diffuser and the geometry form of this light allows you to get professional lighting everywhere you go. It will make your selfies, videos and everything taken from your camera look incredibly good. Rechargeable battery: Allows you to save money, recharge your device anywhere you go and keep using it while it is charging. Adjustable LEDs brightness and colors: The 53 LEDS are super bright at full power, allowing you to illuminate rooms when you were in total darkness. The light comes with three light intensities: high, medium and low. It also comes in 3 different colors: white, warm and both combined. If you have any questions about this product by Louxxi, contact us by completing and submitting the form below. If you are looking for a specif part number, please include it with your message.